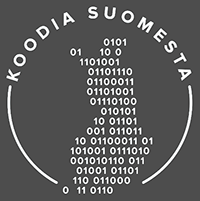 Making the Finnish tax card service electronic with Tax Card Online (Verokortti Verkossa) was the largest user-driven public service project of its kind nationwide. To work in Finland, you need an annual tax card – an official document, which your employer and the tax administration use to see how much income tax, social security contributions and insurance premiums are deducted from your wages. These tax cards needs to be revised and updated every year. When you change jobs or your income changes the tax card needs to be revised. Tax card revisions were a big strain on the work load on the tax planners of Finnish Tax Administration. Citizens had to wait in line on the phone or find time to visit their local tax office during work hours. Annually the group in need of a new tax card has been as big as 1.5 million people. During the month of January, every year, half a million people try to get in through the door or via the phone – 6,000 tax officers just couldn’t handle all the traffic. In addition, since almost 2,000 workers were retiring in the next few years, it was necessary to find effective ways of reducing routine work like typing in data on behalf of the customer. The whole process of revising a tax card was moved online. Any citizen can see their data online, input their new tax information and order a tax card cost free, 24/7 without the assistance of tax planners. The application sends the data to be printed out as a tax card and mailed to the citizen or to the employer. The project was the first of its kind on a national scale in terms of its scope, the volume of orders and its impact on easing the financial life of the population. •interface and implementation practices for applications. During the first year of operation, every 6th tax card (16.3% of 432 300 tax cards) was ordered online. Over 1.5 million tax cards are revised online annually. 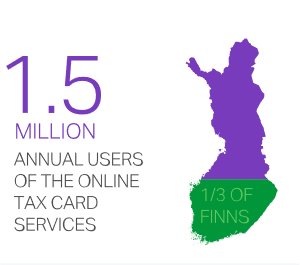 Tax Card Online was one of the first services which gave Finns the ability to see their own real-time data online and edit it. Fewer people were needed for routine work tasks. The effect was immediately noticeable on the phone lines: customers were surprised by getting an answer with no waiting in line. 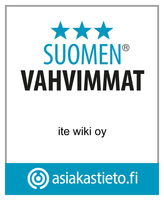 The Finnish Tax Administration was made open 24/7. Thousands of people visit the site at all hours. Feedback was very positive with 3 out of 4 people thanking the service. Citizens were also eager to participate in the improvement of the service, and we gave them the tools to do so. The solution offered a platform for all the future online services of the Tax Administration. The service won multiple awards for being the year’s best public sector service.